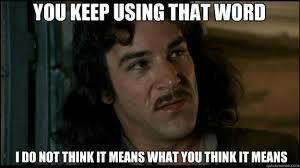 I read a ridiculous argument between writers on whether big words should be used more or less often. Some argued that big words are no longer needed, their time has past, and readers no longer want to read them. Others argued that not enough big words are used and need to be used more often, if for no other reason than to educate the reader. I think the right word or words need to be used. That reading is a time that one can learn but I disagree that the writer is the school master. If a writer is “dumbing it down” to cater to the deteriorating literary skills of today’s reader, or if a writer is using their superior mastery of the English vocabulary to help force readers to “look up words they would otherwise not know”- both approaches are wrong. Books are for two people. Writers and readers. One does not benefit much without the other. Both have varied tastes, education, and goals for their efforts. Writers, tell the story you want to tell in the most effective way you can. Readers, read the authors that scratch your literary itch. And let’s just share some good books together.